I’ve been in DZZ down to partial position size for over a year. There were many mistakes made that I’ve eluded to in prior posts although I’ve certainly focused mainly on the positives till now. Marking up the chart below I wonder where my confidence came from. Despite talking the talk, I had hardly began things by walking the walk…at least confidently and with purpose and plan. 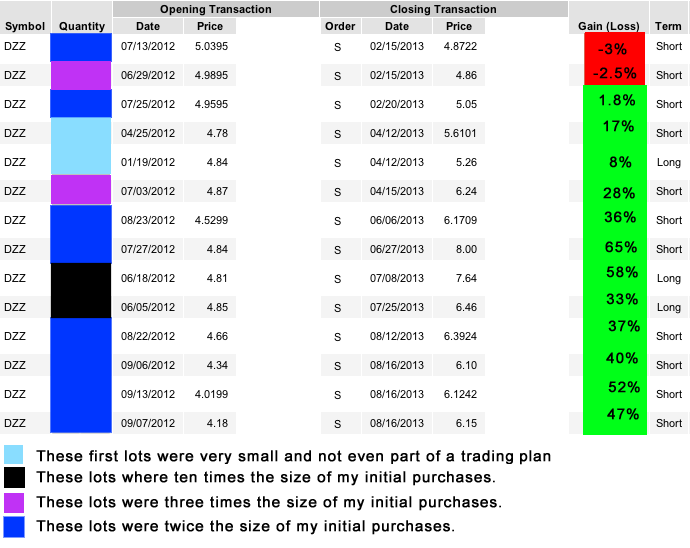 Initially I had on a position with basically no plan, trading simply to trade looking for a big breakdown- baby blue. The trade started working and I upped my position size to a “max” and made my trade a position- black. This is the point where I think I cant be wrong by fading with size. Next with smaller size and softened confidence because the breakdown in Gold didn’t happen I added again full of pride- purple. Everything a looser does well. Finally with a meaningless position now “meaningful” and still not producing much I began to look at the big picture vs the position, quantified a risk (finally and much larger), understood a new larger time frame and continued to short gold- royal blue. 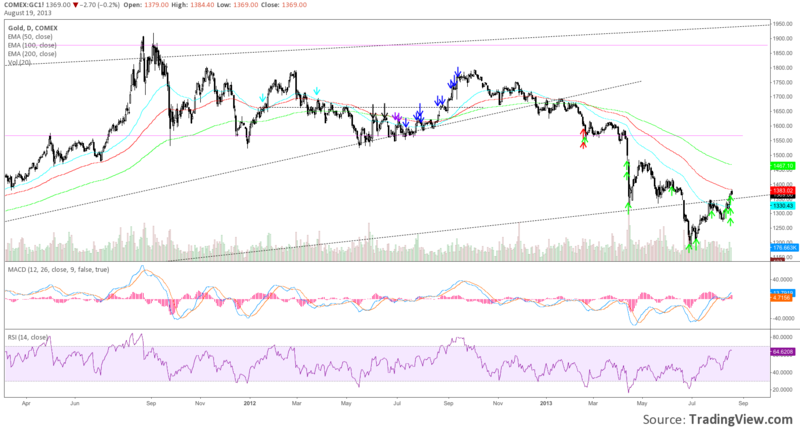 A positive- once my risk was defined the pressure was off I had fun with my analysis and posted a good breakdown of gold. The Path Higher In Gold Is Heavy. I still was never fully confident in such a long time frame and admittedly too large a size. Taking off positions for losses and small gains even as the things started to go my way. In turn, I also expected too much when things were really all that one could hope for. Finally I want to acknowledge a emotional trend that I hope has run its course. A large amount of analysis and understanding came from an even larger lack of planning and as things started going my way I certainly took on the persona of “expert”. To the point where I questioned those superior my experience that wanted to go long gold. I did so here “Grandpa” Likes Gold And Hates The Dollar. While I made some good arguments in jest and was thinking clearly about the price action at that point Im not thrilled of the way I handled myself here. I could have been humble even while having fun, I needed to remember how I fell into this trade doing everything I shouldn’t have before it started working for me. Ironically no one outside of those who read the post, few, would know that I was short gold. I never told anyone. There was a conflict of interest throughout the life of this trade between the ego and the self. I read this tweet by @ppearlman in June 2013. Im not sure where it stemmed from but I’ve been holding it for this moment as my conscious took to it then. Its been hard holding onto this trade for so long but not only for the right reasons. Ultimately I was profitable, but I walk away with much more value by also understanding where I was wrong.